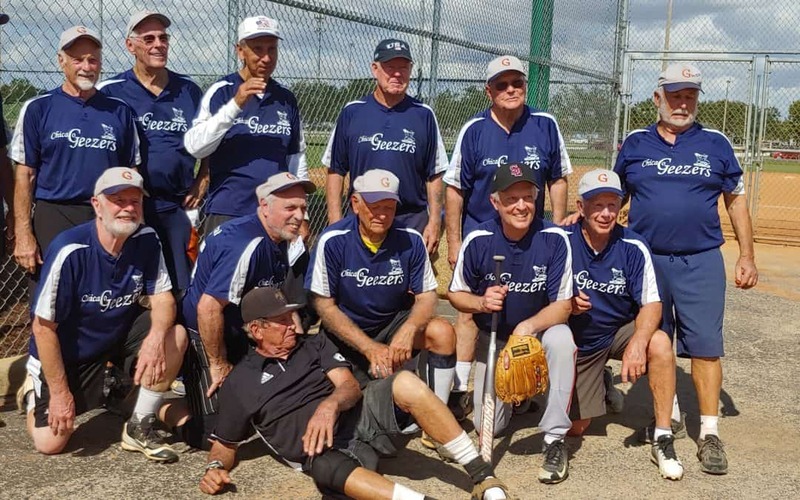 “THE GOOD NEWS IS THAT MY 80-YEAR-OLD TEAM ‘CHICAGO GEEZERS’ WON THE WINTER NATIONALS FOR OUR AGE GROUP IN FT MYERS 11/6 – 11/8. I RAN FOR MYSELF AND HIT .710. THE BAD NEWS IS MY LEFT KNEE IS A BIT MORE ACHY NOW, EVEN WHEN I AM SLEEPING OR NOT PLAYING SOFTBALL. IT IS NOT REALLY PAINFUL BUT IT DOES ACHE MORE THAN IT USED TO. HOPEFULLY, AFTER A FEW MORE MONTHS WE WILL NOTICE A REAL IMPROVEMENT” J.H. While growing up in Albany Park, 16-inch softball was a way of life starting at the Haugan Grammar School playground in early February and continuing until the football season in the late fall while basketball went on all year round. Weather permitting, we relocated to Jensen Park and later during high school years to Eugene Field Park, River Park and eventually the Hibbard School Yard. Softball teams with such names as the Torpedoes, Majestics, Olympians, Phaetons, Regular Fellows, Little Gents, Jovens, and Aristocrats, to name a few, competed for the highly coveted Ned Singer softball championship. Teams were comprised of teenagers representing Amundsen, Austin, Roosevelt Sullivan, Senn, Von Steuben High Schools and more. The soft ball leagues diminished in numbers after high school but several individuals continued playing wherever and whenever possible. I for one played until age 40, ending my career with a triple play and fractured finger at Union Park in the Hospital league. A new 16-inch clincher is hard as rock. There are few remaining players of that generation; I am privileged to serve as a treating physician to two. Jimmy, someone I met when he beat out a ground ball over 00 years ago, (I was a first baseman) practices law and continues to play. Though he had overcome many softball related injuries during his playing days, he was ready to quit three or four years ago out of embarrassment at the pinch runner until I intervened with a Cellular Orthopedic intervention and he regained the ability to beat out a ground ball. Jerry, middle row in the photo, second from the left, continues to play. Two years ago, also very concerned about his ability to run around the bases, he presented to my office seeking an alternative to a Total Knee Replacement for his arthritic knees. One picture says it all; he is already making plans for next year. In Jerry’s case, it took several biologic interventions; but he is a champion. To schedule an appointment and learn about the biologic options for your joints call (847) 390-7666. You may visit my web site at www.Sheinkopmd.com.